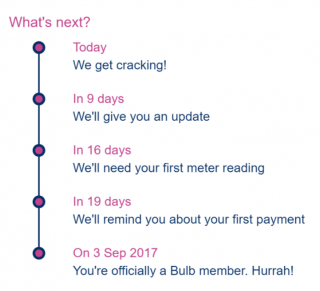 I’ve just signed up with Bulb for home energy and will change our business over to them when our existing contract runs out. I chose Bulb because they’re a modern energy company. Disclaimer: This post contains referral links and thoughts on energy companies. I find it hard to understand why energy companies are allowed to have more than one tariff. The product doesn’t change, the delivery doesn’t change, you just pay a different price for the same thing. Bulb has one price. It varies by region, but perhaps there are logistical reasons for that. They’re also cheap. They were the cheapest in my area and are one of the cheapest throughout the UK. A lot of energy companies agree a fixed price deal with you for x months and then when that runs out, they move you onto a substantially more expensive tariff. Some people probably forget to check and change at that point. One tariff that is competitively priced resolves that. Their electricity is 100% renewable. Makes sense. 10% of their gas is from renewable sources. Great. Their website is simple. The process is simple. Energy is not complicated. I remember dealing with British Gas or other big firms and everything seemed complicated. Pricing, processes, even just getting through to someone who could help on the phone. Bulb is simple. Switching is super simple. You fill out your name and postcode, email, DOB, choose a password, enter your debit card and you’re done. You can see a timeline of the process and they count down the days until your switch completes. 21 days. They ask for meter reads with 5 days to go. You maybe aren’t aware (I wasn’t) that commercial energy contracts are fixed. There’s no getting out and paying a leaving fee of £30. If you agree a 2 year deal you owe them your expected spend per month for those 2 years, end of story. I don’t understand that. Why should business be any different to consumer. Bulb is slightly different from consumer to business in that they don’t offer referrals to business but otherwise it’s pretty much the same. The price is slightly different too, maybe there’s a reason for that, not sure. But there’s the same single tariff and no fixed contract. Leave at any time. Same for consumer. No leaving fees. They want to keep your business by providing good service, not locking you in. The icing on the cake is a referral system. You and I get £50 off our energy bill if you sign up via this link. An early growth mechanism that probably won’t last forever, but great all the same.